The dawn of the smartphone has played a critical role in transforming nearly every industry — from transportation to retail to hospitality and beyond. But healthcare has not yet had its “iPhone moment.” So far, there has been no platform powerful enough to fundamentally change the way we interact with healthcare in the same way that the smartphone and apps like Uber, Amazon, and Airbnb have changed their respective industries. Despite the recent explosion of wearable sensors and health-and-wellness apps now available to consumers, these technologies have only been able to affect change in healthcare delivery piecemeal, at best. Healthcare, to no one’s surprise, is a bit more complicated than hailing a cab. With the vast number of sensors and mobile applications available, there is immense potential for transforming healthcare into a patient-centered service with a streamlined, personalized, and engaging patient experience. The problem is there hasn’t been a platform to integrate all of those technologies into one comprehensive and centralized point of access to healthcare delivery. This is the problem we at Aspire Ventures set out to solve with a new venture called Connexion. 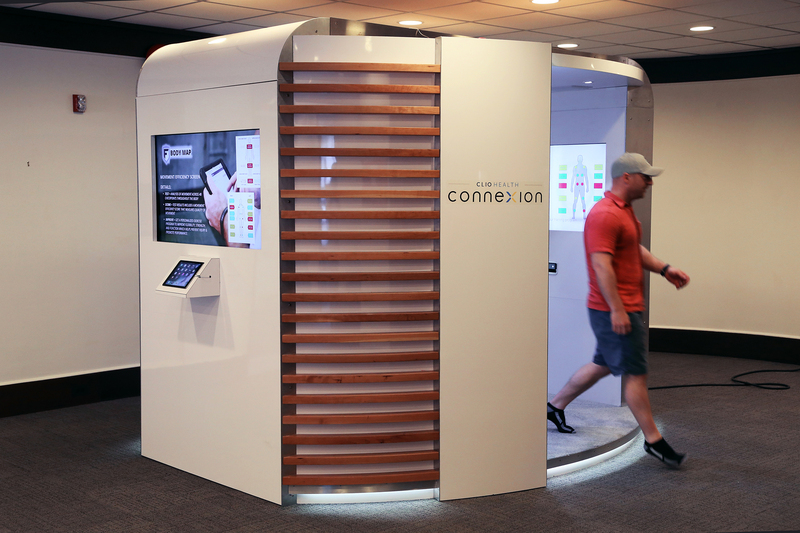 The Connexion platform, a healthcare kiosk that fuses multiple powerful sensors with artificial intelligence for automated health assessments, not only connects and integrates disparate technologies into one engaging device, it will also connect patients to their healthcare — giving them easy access to rapid assessments, deep insights into their health, and recommendations for next steps in their care. The Connexion concept has been garnering intense interest from the healthcare community as a solution for dramatically increasing access to care, streamlining the healthcare experience, and empowering patients with deep insights into their health. But consumer-facing health systems aren’t the only ones who see value in this venture. Over the past week, Connexion has been getting a lot of attention from the sports science industry. We debuted our first prototype last weekend to professional trainers at the NBA Combine in Chicago, with our new partner Fusionetics, a global provider of evidence-based performance healthcare solutions for more than 300 professional and college athletic teams. Five weeks ago, we began working with Fusionetics on a new vision for automated health assessments for professional sports trainers. Our task was to build the first iteration of the Connexion platform, while Fusionetics was set to integrate their clinically proven performance health assessment system as our platform’s first featured application. After those five short weeks of development, we built a healthcare kiosk that successfully fuses multiple sensors to capture visual, auditory, and pressure data. That data is processed with our adaptive artificial intelligence platform, A2I, to create a 4D picture of the user’s health. We worked with leading live event supplier Tait Towers to design and assemble the physical kiosk. And working with Fusionetics, we integrated their system to automatically measure movement efficiency with an engaging, intuitive assessment that athletes can complete on their own in a matter of minutes. The result of this joint venture, called Fusionetics+, has been met with enthusiasm that has far exceeded our expectations. We sent a team to the NBA Combine in Chicago to debut our first prototype with Fusionetics. After a weekend of private demos for select NBA teams and trainers, it’s clear that this is the technology the world of sports science has been waiting for. Trainers, doctors, and team executives took turns trying out the Connexion experience, and the response has been universally and overwhelmingly positive. This game-changing technology will capture an unprecedented amount of data, unlocking deeper insights into performance health that, frankly, the sports world has never seen before. Connexion will streamline training operations and help trainers select athletes, prevent injury, and maximize performance potential. And that’s just the beginning. A host of other applications, with new sensors and new functionalities, will make Connexion a comprehensive health and fitness platform that will let everyone engage with their healthcare like never before.